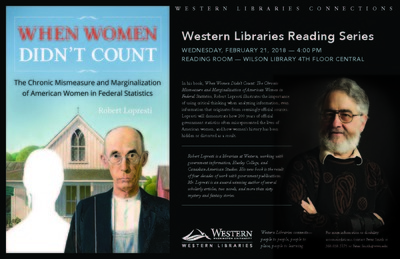 Western Libraries government information librarian Robert Lopresti gave a talk about his recent book “When Women Didn't Count, the Chronic Mismeasure and Marginalization of American Women in Federal Statistics,” from 4:00-5:00pm on Wednesday, Feb. 21 at Western Libraries in the Reading Room (Wilson Library 4th floor Central). The event was free and open to the public. Lopresti explored how women’s history has been hidden and distorted by 200 years of official government statistics, and how some of the statistics that have shaped perceptions of American women have often been incorrect or based on false assumptions, essentially misrepresenting the lives of women. Lopresti’s book traces the development of data on population, employment, crime, health, and many other topics, beginning with the first Census in 1790 when only the male "head of the household" was listed by name. Lopresti examines problems with data and illustrates the importance of using critical thinking when analyzing information, even when that information is from seemingly official sources. Lopresti is a librarian at Western, working with government information, Huxley College, and Canadian-American Studies. His new book, "When Women Didn’t Count," is the result of four decades of work with government publications. Lopresti is also an award-winning author of several scholarly articles, two novels, and more than sixty mystery and fantasy stories. This resource is provided for educational purposes only and may be subject to U.S. and international copyright laws. For more information about rights or obtaining copies of this resource, please contact University Special Collections, Heritage Resources, Western Libraries.